Description: This quilt pattern is inspired by flying and airplanes. When you are up in the air looking down at the ground-arent you reminded of a quilt? This book of airplane related-blocks lets you capture that feeling. The difficulty of the blocks range from very easy to challenging. The skills you will develop or use include strip piecing- conventional machine piecing (although you can make yours by hand if you wish)- paper piecing and also a little embroidery and applique. 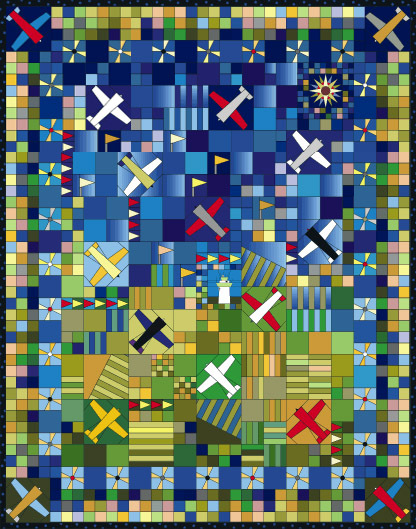 Layouts are included for wall hanging; crib-size; twin-size and queen-size quilts. The book includes color quilt layouts- block patterns- detailed block instructions are general fabric requirements.